"Creamy peanut butter balls coated in a chocolate coconut shell are perfect for a delicious holiday-time candy. With the taste of a Reese's® and the hint of coconut, you will be devouring these by the minute." Stir confectioners' sugar, peanut butter, and butter together in a bowl using your hands until well mixed. Shape mixture into 1-inch balls and arrange on a waxed paper-lined baking sheet. Freeze peanut butter balls while preparing chocolate shell. Melt chocolate chips and coconut oil together in the top of a double boiler over simmering water, stirring frequently and scraping down the sides with a rubber spatula to avoid scorching, until smooth, about 5 minutes. Remove double boiler from heat and set aside for 5 minutes. Remove peanut butter balls from freezer and dip each ball into the melted chocolate until evenly coated. Place coated peanut butter balls back on the baking sheet. 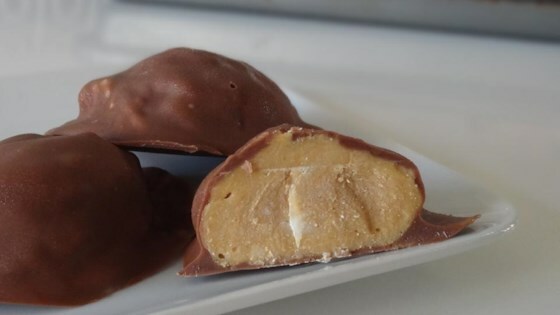 If the chocolate mixture does not harden on the peanut butter balls, put the coated balls in the freezer for about 10 more minutes or until the shell has hardened.